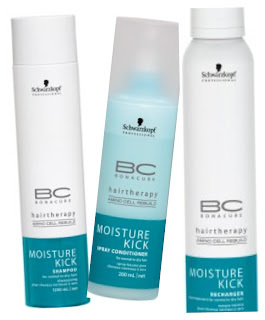 Sophsterlicious • UK Blog: Bonacure Moisture Kick Haircare Review. This shampoo is lush, it smells delicious and lathers nicely. You only need to use a small amount and it leaves my hair feeling really smooth manageable, It definitely does what it says on the tin and puts moisture back into my dry ends, and also smooths them too. I really love how the scent of it lingers on my hair though, I don't know quite how to describe it, but every time I use this in the shower I 'Mmm and Aaah' over the smell, It's gorgeous. Now this I LOVE and have been using loads. It is a mousse conditioner that you apply to towel dried hair and leave on for 10/15 mins. The mousse is really light weight and smells gorgeous like the shampoo. I leave it on for 15 mins or so before combing it through (and by then my hair feels silky and so conditioned) and then rinsing it. My hair looks so glossy and it good condition after using this.. You don't need to use it every time you shampoo though, I just use it as a treatment about once a week. Maybe more if I want a hair treat! I use this every time I shampoo (except on days when I use the recharger) .. In all honesty I was never one for leave in conditioners and thought they were for kids with tangles, but this is really nice. I just spritz it all over my towel dried hair and it acts like a normally conditioner (just without rinsing! ), making my thick curly hair more easy and manageable to comb and style. Once again it smells delicious and puts moisture back into my hair, that all of the heat from straighteners and hair colours take out.